Revenge can be pretty sweet. Dang Serenity…. What are your secrets? Thanks for the welcome Sireana :D! Welcome back, sweetie! Great job! Especially how accepting she is of all that love, hahaha! Chibi-Usa would have a line too! Helios, Peruru, Masanori (from ep. 107), Hotaru, and Setsuna. Must be a family trait to attract so many people lol! I love this lmao I spent an embarrassing amount of time thinking that was Fiore and being confused af before going oooooh yeah. Nice to see you’re back in action. Thank you ^^ Does feel good to finally get something up! HAHAH love this version!!! XDDD Great work as always chibi!! Happy new year, Chibi Jennifer. Your Drawings are soo cute! 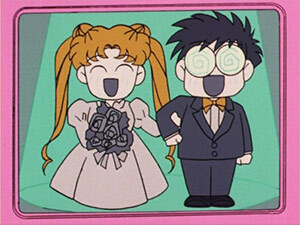 Yeah, I think we should see a least some jealousy from Mamo-chan from time to time XD It’s always poor Usagi going crazy! haha yeah..remember how Umino was a bit crazy about her in season 1? XD Before Naru, anyway. Hysterical as always. =j I love finding these in my inbox! OMG! Chibi-Jen’s back! It’s a miracle! Well, this comic just described one pf my pet peeves about Sailor Moon; it’s Usagi who gets just about every single guy out there falling in love with her. What? The other girls aren’t attractive enough? That’s… Incredible… Chibi Jen is back! I thought you’ve stopped making Sailor Moon comics forever! I’m so happy you’re back! It is good to be back ^^ Happy New Year :D!! !